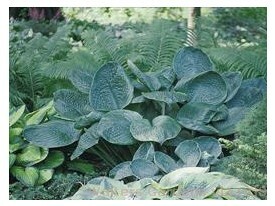 Product Information : Huge, blue, umbrella-like leaves exhibit excellent slug resistance. Forms a large mound; makes a beautiful specimen. Tends to darken to green by early summer. Pale lavender flowers.